2013 has included over 50 musical performances, art exhibitions, creativity panels & artist residencies. I am humbled by the numerous ways I have connected with people in over a dozen different cities. Here's more about this fulfilling year. Stuck Elevator (libretto by Aaron Jafferis, directed by Chay Yew) premiered with 28 performances at the American Conservatory Theatre in San Francisco, then 12 shows at Long Wharf Theatre as part of the International Festival of Arts & Ideas produced by ArKtype in New Haven. Nonsequitor presented Welladay! Welladay! Wayward Love Songs prompted by James Joyce, orphans and unwed mothers at the Chapel Performance Space in Seattle. Either/Or performed Kiss/Kuss/吻 as part of the Cage100 Party Pieces Project at the Miller Theatre in New York. The year started with the Chicago Composers Orchestra performing Occupy Orchestra 無量園 Infinity Garden at the Garfield Park Conservatory in Chicago. The work was influenced by Chinese gardens, John Cage and the Occupy movement. My work was included in the Party Pieces Exhibition at the Galerie für Zeitgenössische Kunst in Leipzig and Chamber Music at the Frye Art Museum in Seattle. Idea Lab at the Grantmakers in the Arts Conference in Philadelphia, on Sharing Our Stories: Work from the Field for the Opportunity Agenda Creative Change Retreat at Sundance, for What is American Culture? at the TAAC (The Association of American Cultures) Open Dialogue: People, Places and Policy in Providence, on Working Across Cultures at the International Festival of Arts & Ideas in New Haven, plus as part of Edge Effect: How Diversity Fuels Creativity at the TCG National Conference in Dallas. As a Creative Capital Artist Advisor I worked with grantees at the orientation weekend in Brooklyn and for the retreat at Williams College. Additionally, I led workshops as part of Creative Capital's Professional Development Program in Nashville and Philadelphia. Before the year ends, I go to the Sundance Institute Theatre Lab at MASS MoCA to start work with Aaron Jafferis on Trigger, a theatrical oratorio for 32 singers about mental health & violence prompted by the Virginia Tech Massacre. 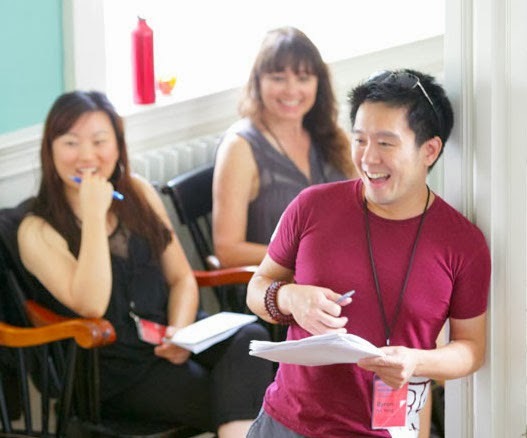 Another recent residency was at the American Conservatory Theatre, where I worked with director Carey Perloff, designers and actors/musicians at The Orphan of Zhao music/movement workshop in San Francisco in preparation for the production at A.C.T. in June 2014 and the La Jolla Playhouse in July 2014. Sign up to hear about upcoming 2014 events.